In this volume is presented, for the first time, a critical edition of the earliest retrievable text (i.e., the Versio Antiqua) of the Gospel of John in Classical Ethiopic (Ge'ez). Altogether 21 manuscripts have been collated, representing four different text types and, for the first two of these, three and four sub-types respectively. The Versio Antiqua is represented by the first text type, of which, for the most part, the important Mss Abba Garima I and III, dated to 1270 or earlier, have been employed for the basic text. 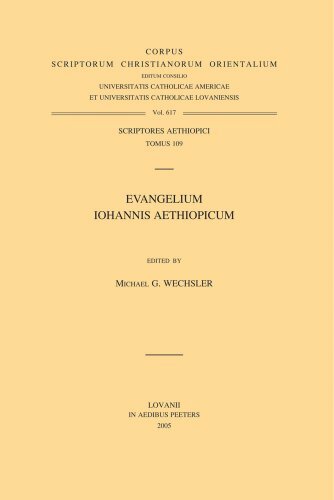 Five appendices are also included, in the last of which is supplied a collation of the Versio Antiqua with the critical apparatus of the 27th edition of Novum Testamentum Graece. This volume, consequently, should prove useful to anyone interested in textual criticism of the New Testament, the textual history of the Ethiopic Gospel of John, or Ge'ez literature generally.